A popular story claims that one of the foremost intellects of all time, Isaac Newton, was inspired to formulate his theory of universal gravitation by the fall of an apple from a tree. Cartoons have gone further, to suggest that the apple actually hit Newton on the head and that its impact somehow made him aware of the force of gravity. As Isaac Newton might have attested to, often times the keys to life’s most difficult puzzles are hanging just out of our field of vision—perhaps within reach, but still unrecognized—until they drop like an apple from a tree and hit us on the head. Suddenly, the missing piece has fallen into place and the proverbial light bulb has been turned on, illuminating the solution to the entire puzzle. In regard to Bible prophecy, many are coming to believe that Islam is that missing piece, and the rise in global terrorism is, in many ways, the apple that has fallen. Throughout the millennia, Bible scholars have labored to grasp the meaning behind some of the more mysterious passages of Scripture. Many have struggled in vain, however, lacking the necessary insight to unlock the mysteries contained therein. 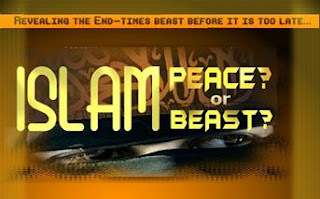 In identifying Islam as the end-times Beast, we have established a paradigm, or a model, against which we can compare various end-times passages from the Books of Daniel, Revelation and others. This model can thus be used to test the viability of our theory across a broad range of Scripture. In this chapter, we will put to full use our knowledge of Islamic behaviors and principles by holding these things up to what the Bible tells us about the Antichrist. Will our Islamic insight cast a revealing light on the end-times prophecies, or will they remain shrouded in mystery? Considering the laws of chance and probability—and also allowing for the fertile imaginations of some who study prophecy— it would not be unrealistic to assume that one might find several verses which seem to harmonize with the concept of an Islamic Antichrist. Nevertheless, in order to be considered viable, the Islamic antichrist model must fit squarely with what the Bible says, not only in one or two instances but in every regard; if it does not, the theory must be rejected. In order to test our theory, we will begin by taking a look at some well-known yet consistently perplexing verses. For the purposes of this exercise, keep in mind that, as we learned in chapter nine, the term “beast” generally refers to a kingdom, within the context of Bible symbolism. Therefore, since we are proposing that Islam is the Antichrist power of the end times, we will mentally assign Islam, or an Islamic kingdom, to the term “beast” where it is used in the Scriptures. Until recently, most Bible scholars have had no plausible explanation for the meaning of this “image.” Some have suggested that it might be a statue, or an idol, of some kind. Though, if we assume the image to be some type of idol, or inanimate object, we are faced with a dilemma in that the Antichrist later causes many to “worship” the image (Revelation 13:15). If they refuse to worship the image, he orders that they should be killed. This obviously presents a problem for the Islamic antichrist thesis, as a true Muslim would not, under any circumstance, wittingly bow to worship an object or idol. As noted throughout this book, the very foundation of Islam is based on the notion that Allah is the one and only god. This being the case, for the Antichrist to propose that anyone bow before a graven image of any kind would make him guilty of an unpardonable sin from the Islamic perspective. Considering this, if our Islamic Antichrist theory is to pass the test, there must be some other explanation for this “image”—but what could it be? To gain some insight into the intended meaning of this verse, we are going to focus on the key word, which is, of course, “image.” In this case, it will be helpful to look at the way in which the word image is used elsewhere in the Bible. For instance, in the Book of Genesis we note that God uses it thusly: “Let Us make man in Our image, according to Our likeness…” (Genesis 1:26). Here, God is essentially saying that man was created as an animate, flesh and blood “likeness” of Himself. If we apply this same concept to our verse from the Book of Revelation and think of this “image” as more of a living, breathing imitation, or likeness, of something—rather than a mere object—the verse takes on a slightly different flavor. It now seems to suggest that this individual (the Antichrist) is not calling on those who dwell on the earth to make a statue, or an idol, in tribute to the “beast” but is, instead, calling on them to assume a likeness, or to imitate the Beast—in effect, making a copy of Islam. In other words, the Antichrist is saying to all nations that they should model their societies into a likeness of Islamic society—a society based on Islamic laws and principles, or Sharia. In putting out the call to Islam, the Antichrist is echoing the frequent statements made by Osama bin laden and other prominent Muslim leaders of today. Indeed, like his fellow Muslims, the Antichrist desires that the entire world be modeled in the ideal “image” of Islam. It is amazing to consider that this verse may very well be alluding to the recent—and future—call for the reestablishment of an Islamic Caliphate, which would, of course, be modeled after the image of the Arab and Ottoman Empires of the past. Today, there is only one world religion or political ideology on earth that wishes to impose its own laws and principles on all people, thereby forcing all nations to remake themselves in its own image. It is Islam. In the previous verse, we observed the Antichrist putting out the call to “make an image to the beast.” Here we see that he somehow has the “power” to “give life unto the image”—and then he causes all who “would not worship” the image to “be killed.” Again, this verse has been found by many a scholar to be utterly bewildering. Though, as it happens, our Islamic insight may serve to dispel some of the mystery. It should be noted that in ascribing a symbolic meaning to the Antichrist’s giving “life unto the image,” we have not merely made an arbitrary decision to do so. As we learned earlier, the Book of Revelation is, for the most part, a symbolic book, in which allegory is used to illustrate literal events. Therefore, the imagery of the Antichrist symbolically giving life to the Beast (Islam) fits very well within the overall genre of the Book. Further, the alternative possibility—which is to interpret this verse literally—presumes that the Antichrist (or Satan) actually has the power to give life to some type of inanimate image or statue. This, of course, is not a plausible interpretation, as only God has the power to give life. At this point, having analyzed only two verses, we can already see a picture beginning to form: The Antichrist has essentially ordered all those who dwell on the earth to create a new Islamic Empire, or Caliphate. As we witness the birth of this kingdom, it becomes increasingly clear that the Antichrist is a ruler who wishes to impose a specific set of laws and principles upon all those who “dwell on the earth.” By telling all to assume a likeness of the Beast, he is, in all reality, requiring that everyone convert to Islam and submit to Islamic Laws. The only alternative for those who do not, is death. Again, this model of behavior fits squarely with Islamic beliefs and ideals. These same actions can be consistently observed in the headlines today, as Islamic extremists call for the entire world to be ruled under Islam and Sharia Law. All dedicated Muslims who follow the teachings of the Koran are commanded to advance Islam until it is the only religion. Simply put, the goal of Islam is to rule the world. The first line of this verse reveals that the Antichrist shows no regard for the “gods of his fathers.” If the Antichrist is indeed Arab, as we are proposing, then his forefathers (the pre-Islamic pagan Arabs, as referenced in chapter four) actually worshipped three hundred and sixty individual deities. Again, it was not until the seventh century A.D. that Muhammad would challenge the paganism of his forefathers and introduce the worship of his singular god (Allah), in the form of Islam. Thus, neither Muhammad nor his descendant, the Antichrist, will have acknowledged, or shown “regard,” for the gods of their forefathers. Islam, at its core, is extremely oppressive toward women and shows less regard for their needs, or desires, than any other world religion. Under extreme Islam, there are severe restrictions imposed on dress and legal rights—including the right of a woman to leave her home without a husband or male relative. In some cases, the laws are less strictly enforced, but the general spirit of Islam is nevertheless very unsympathetic with respect to women. In light of this, it makes perfect sense that the Antichrist, being a devout Muslim, would show little regard for women or their desires. The middle part of the verse states that neither does he “regard any god.” The Islamic creed, or Shahada, is universally known throughout the Muslim world and is commonly stated as follows: “There is no god but Allah and Muhammad is his prophet.” This statement leaves no room for equivocation; Muslims are adamant that there is “no god but Allah.” For this reason, any god other than Allah would not be regarded as a “god” at all. Lastly, we see that the Antichrist will “magnify himself above all.” This parallels the behavior exhibited by previous Islamic leaders, including Muhammad and his successors, the Caliphs. Their authority was absolute and unquestionable. Viewed within the framework of Islam, every aspect of this verse now makes perfect sense and is easily understood. Yet, if one removes Islam from the equation, the passage tends to revert back to a mystifying puzzle. But in his place shall he honor the god of fortresses; and a god whom his fathers knew not shall he honor with gold, and silver, and with precious stones, and pleasant things. Here, we learn that the Antichrist will honor a “god of fortresses,” or a god of war. He will also honor this god, “whom his fathers knew not,” with all manner of material wealth. In the second part of the same verse, we observe that the Antichrist honors his god with “gold and silver” and other “pleasant things.” As is detailed in the Koran, Islam requires Muslims to use their wealth to honor, and to fight for, the cause of Allah: “The true believers are those that have faith in Allah and His apostle, and never doubt; and who fight with their wealth and with their persons in the cause of Allah. Such are those whose faith is true” (Surah 49:15). Again, both of the principles highlighted in this verse fall in line with the model of Islamic behavior that was established by Muhammad. Without the insight gained by looking to the religion of Islam as the antichrist power, this verse, once again, becomes difficult to decipher. Here, the term “foreign god” refers to Allah, as he is certainly a false or “foreign” god. In the third line of the verse we learn that the Antichrist will “increase with glory” all those who recognize Allah as god and Islam as the true religion. As leader of the Muslim world, the Antichrist then delegates authority to those who acknowledge his rule—dividing amongst them the lands that he captures. These actions fit the profile of one who is emulating the prophet Muhammad or, perhaps, the Islamic Caliphs, as they swept across the Middle East—conquering the lands and sharing the spoils of war. Once more, we find a verse describing actions that are consistent with Islamic doctrines and traditions. As we progress, it is becoming increasingly apparent that the Antichrist is modeling his behavior after the example set by Islam’s archetype of the perfect human being, Muhammad. As noted in earlier chapters, a dedicated Muslim—as the Antichrist most definitely will be—is taught to model his actions on the life and teachings of Muhammad in all ways. In this verse, John describes a vision in which he sees “the souls of them that were beheaded for the witness of Jesus, and for the word of God.” These “souls” are, in fact, the people who have been “beheaded” for the very reason of their bearing witness to a belief in Jesus Christ, as well as their refusal to worship the Beast. As we study this passage, the question that comes immediately to mind is, why did God choose to specify that these souls had been “beheaded?” During the first century A.D., when the Book of Revelation was written, the most common method of killing was crucifixion; stoning, burning, and strangulation were also used. This being the case, God could have just as easily inspired John to use more general terms, perhaps conveying that these souls were simply “killed” or “martyred” for their beliefs. What is more, the practice of beheading is considered to be part of the very heritage of Islam. It is not only commanded as a specific method of killing one’s enemies in the Koran (“When ye encounter the infidels, strike off their heads”—Surah 47:4) but was the favored method of killing by Muhammad and his followers. The Qurayza had rejected Muhammad’s claims of prophethood, thereby calling into question his authority over Medina. Tensions mounted between the two communities, and the Qurayza soon found themselves embroiled in battle with Muhammad and his men. At some point, Isolated and besieged, the Qurayza were left with no other option but to surrender to Muhammad—thus, falling subject to Muslim justice. On Muhammad’s order, some six hundred to nine hundred Jews from the Qurayza were led to the Market of Medina. Trenches were dug and all of the men were beheaded. Their decapitated corpses were buried in the trenches while Muhammad stood in attendance. While examples such as the massacre of the Banu Qurayza are shocking from any perspective, we in the West have previously taken comfort in the fact that this type of barbarism had long been abandoned. Indeed, before 9/11 and the upsurge in Islamic terrorism, beheading was considered by most to be an ancient form of execution, no longer practiced, except, perhaps, in some isolated third-world regions or strict Muslim societies. For one to suggest that beheading might be the preferred technique of some future tyrant would seem doubly odd, especially in light of the numerous high-tech methods of killing that are available today. Nevertheless, this ancient practice appears to be making a comeback. Written nearly two thousand years ago, this Bible verse now takes on a completely contemporary feel, as beheadings have become almost commonplace in the news. Incredibly, we have actually witnessed the beheadings of westerners at the hands of Muslim extremists, videotaped and posted on the internet for all to see. Here, we find that the Antichrist has put forth an edict declaring that unless one has taken “the mark, or the name of the beast,” they cannot “buy or sell.” The meaning of this mark will be explored in a later chapter. For now, it will suffice to say that it is simply a way of identifying oneself as a Muslim. In reading this verse, we are first struck by the fact that a form of selective discrimination against non-Muslims has been implemented. This echoes the long-held Islamic tradition of dhimmitude. Again, under a system of dhimmitude, policies are put in place which favor Muslims and subjugate all non-Muslims within the society. As farfetched as it may seem, many observers warn that as Islamic banking gains a significant foothold around the globe it becomes much easier to envision how one’s ability to “buy or sell” might become contingent upon his compliance to Sharia. To expand on this idea even further, some have suggested scenarios in which the Antichrist might choose to halt the sale of Middle Eastern oil to those countries that refuse to operate under the guidelines of Islam. Nonetheless, in spite of the seemingly global implications, the actual scope of the Antichrist’s order to exclude non-Muslims from commerce remains somewhat of a mystery. It is a distinct possibility that this verse may be speaking more of a local decree that would affect primarily those non-Muslims living within the immediate boundaries of the Antichrist’s Kingdom. Such a scenario might merely involve preference being given to Muslims in regard to buying food and other necessities. Whether this edict is more regional or global in nature will eventually become clear. For now, however, one thing is certain: This ancient Bible verse points to Islam in every sense of the word. In this verse from the Book of John, Jesus tells His disciples that a time is coming when anyone who kills a Christian or Jew will think that he is doing a service for God. From the disciples’ perspective, it would have been difficult to make sense of Jesus’ statement, as it seems to be counterintuitive. They must have asked themselves how it might be possible that someone could kill God’s own people yet think that they are doing Him a service. The disciples, of course, had no idea that one day a false religion would arise, deceiving billions into worshipping a god who masquerades as the one true God. They could never have imagined a scenario in which this false god would then require—as a service to him—that Christians and Jews be destroyed. Again, Islam is unique among religions in that its holiest writings condemn Christians and Jews, specifically, for their beliefs. No other faith fits the profile of having a god who commands the persecution of these two groups. The Muslims that kill infidels (Jews, Christians, and other nonbelievers) honestly believe that they are doing God’s work. He will confirm a covenant with many for one seven. In the middle of the seven he will put an end to sacrifice and offering. And on a wing of the temple he will set up an abomination that causes desolation, until the end that is decreed is poured out on him. There is virtually unanimous agreement among Bible scholars that this verse refers to a seven year peace treaty that will be signed between the Nation of Israel and the Antichrist. Yet, our focus here is not directed at the confirmation of the treaty but at the underlined portion of the verse, which indicates that the agreement will be broken by the Antichrist at midpoint, or after three and a half years. On one hand, the breaking of this treaty is significant because most scholars believe this to be the event that will trigger the period known as the great “tribulation”—setting the clock ticking on the last few years of history as we know it. But the primary reason that we find the breaking of this treaty so interesting is the fact that the Antichrist’s actions here parallel a well-known tradition within Islam, which is, oddly enough, the breaking of treaties. In 628 A.D., Muhammad attempted to make a pilgrimage to the Kaaba in Mecca. As he neared, the Meccan troops opposed him and forbade him to proceed. Because Muhammad’s men numbered only 1,400 at the time, he entered into negotiations with the Meccans and came to an agreement known as the Treaty of Hudaibiyya. Only eighteen months into the ten year treaty, Muhammad’s army had swelled to ten thousand men. Realizing that he had gained sufficient forces, Muhammad immediately set out to conquer Mecca and exterminate the Jewish tribe. In doing so, he established forever the obligation of every Muslim to enter into covenants with non-Muslims when necessary—this, with the understanding that these agreements would be broken as soon as it was expedient to do so. The fact that the Antichrist will ultimately break his treaty with Israel, suggests a Muslim acting in the tradition of his prophet, Muhammad. To be sure, neither honor, nor ethics, nor obligations, can be allowed to hinder the advancement of Islam. Secondly, we observe that the Antichrist “shall wear out the saints” (Christians) and will try to change the “times and laws.” Without the benefit of insight, the Antichrist’s actions here seem to be completely bizarre. While it is conceivable that a new ruler might desire to change existing laws, why would one attempt to change the set “times” or calendars? Looking once more to Islam, a highly plausible explanation is found. In addition to the Gregorian calendar that is used in the West, there is also a Jewish, a Hindu, and a Muslim calendar, among others. Jews or Hindus, however, are not likely to impose their religious laws or calendars onto the rest of the world. A dedicated Muslim, on the other hand—having a mandate from Allah to dominate the earth—would unquestionably desire to institute the Islamic calendar on a worldwide basis if he should ever acquire the means to do so. Once again, we find that Islam, placed in the role of Antichrist, has shed a revealing light on what has historically been considered to be a very cryptic, if not utterly confounding, Bible verse. As we bring to a close this chapter, in which we have tested the theory of an Islamic Beast, it should be noted that this has by no means been an exhaustive study. A more thorough dissection of the Books of Revelation, Daniel, and many others, would no doubt yield further results. Considering that all of the key prophetic verses we have examined reveal a pattern of behavior and attributes that are Islamic in every respect, one might safely conclude that the hypothesis holds up very well indeed. If only a few correlations could be found between Islam and the Beast of the Bible, then perhaps the phenomenon could be dismissed as coincidence. Nonetheless, the sheer volume and specificity of these parallels seem to advance the notion of an Islamic Antichrist to a point beyond the realm of deniability. But of course, as always, the reader will have to weigh the evidence and judge for him or her-self. In the map You forgot ISRAEL? Do Christians believe Father/Word/Holy Spirit have image or all three were imageless?